In recent years, broadband providers have introduced data caps and other plans that charge customers based on use. While regulators have generally approved of this shift, some consumer groups fear that usage-based pricing will lead to higher prices and deteriorating service. They also fear data caps allow companies like Comcast to protect their cable businesses from upstarts like Netflix. 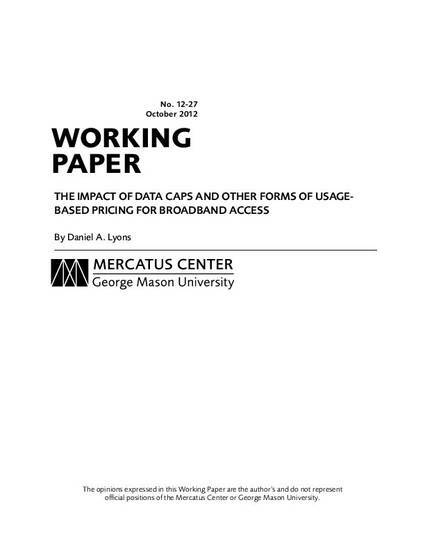 This article evaluates the merits of data caps and other usage-based pricing strategies. Usagebased pricing shifts more network costs onto heavier Internet users. This can reduce costs for others and make broadband more accessible to low-income consumers. Usage-based pricing can also reduce network congestion. While data caps can be used to hurt competition, antitrust law teaches that regulators should intervene only if consumers suffer harm and cannot switch Internet providers. Otherwise, broadband providers should be free to experiment with different pricing strategies to compete for customers and fund future network upgrades.